Have you ever had an experience so powerful that it defines you? Has it literally shaped who you’ve become? Where a person, place or event has become engrained into your very soul? During a heart to heart with my friend Sarah this weekend, it became incredibly clear just what one of my most defining moments is. 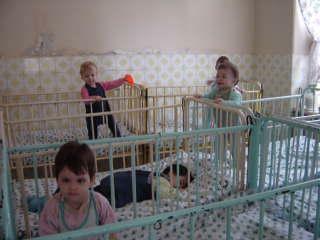 In July 2003 I traveled with World Vision’s Destination Life Change program to Romania, where I spent one month caring for abandoned infants in an orphanage. This was at once the most difficult and the most rewarding thing I have ever done. This task is so much harder than I had ever anticipated. Logically, I knew it would be difficult, but there was no way I could have known what it would do to my heart. The most difficult part of being here in seeing the daily life of these babies. To the caregivers, working there is just that – a job. The babies are often treated as objects, there are few soft, gentle touches, just quick, task oriented ones. Diapers are changed twice a day, so consequently most are wet for most of the day. It is not that the children are mistreated per se – they are physically very well taken care of for the most part. Emotionally and psychologically however, it is a different story. The babies are in their cribs all day, and they belong to no one. If they are one of the lucky chosen ones, they will spend an hour in the play room in the morning. If not, it is 24 hours a day of seeing the world through the metal bars of a crib. No child has any possession of his own and each is known only by the piece of masking tape on the end of each bed, displaying the name of the child. The children do not get to go outside, nor do they get a breath of fresh air from an open window. The reason being that the Romanians believe that they will get a “draft” and get sick. Babies cry from their cribs with nothing to comfort them. No soft toys are allowed in the bedrooms because they cannot be washed should they fall on the floor. A few may be given rattles to play with, but it is pretty hard to snuggle plastic. I have really broken down sobbing a few times, hurting so badly for these perfect, tiny little people. I’ve had to really start concentrating on the little things that will make a difference in each child’s day. Each hug I give, each smile I receive, and each laugh that I evoke are moments that would not have occurred had I not been there. I, along with the other two volunteers, have gone out and bought stacks of diapers so we now change them regularly. At least now they can be a little more comfortable! It is so hard when all I want to do is save them all! …. (After returning home I wrote:) The babies in the orphanage have left imprints on my heart that I know will never fade. I have cried so many tears since I’ve returned, relaying my tales of daily life for the tiny, innocent people who exist and experience life through the metal bars of a crib. I’ve cried for the lack of attention and stimulation. I’ve cried because some of them don’t even have names. I’ve cried because it is so rare that loving arms hold them. I’ve cried because I remember them reaching out to me. And I’ve cried because I love each of them so much. Phew. I am crying again reliving those memories. And this is why I can’t let my children cry. Because even though my heart burst with love for those babies, even though I made it my mission every day to be sure that I snuggled each and every one…. I couldn’t save them. I came home with a wounded heart and empty hands. So every night now my baby is rocked to sleep. And at bedtime my boys are sung to and told that “I love them to the moon and back.” Because I couldn’t save those Romanian babies, but God help me, I am going to save my own in every way I know how. I just want my children to know with every thread of their being, that they are cherished and loved.. to the the moon and back. Just another piece of who I am. This entry was posted on July 21, 2011 at 9:23 pm and is filed under Motherhood. You can follow any responses to this entry through the RSS 2.0 feed. You can leave a response, or trackback from your own site. I just read your blog for the first time while curiously looking up how to become a lactation consultant… Wow. I’m so sad. I kind of want to go and take my 2-month old baby out of her bassinet where she is happily sleeping and cuddle with her. Great blog. I’ll keep reading.